From identifying the right types of influencers to recruit, to using social listenting tools, through to refining your influencer list, this blog will show you how to nail influencer marketing list creation. The rise of influencer marketing as a B2B channel is clear. A 2017 global study of enterprise businesses found that 49% of B2B marketers were experimenting with influencer marketing. Decide the topic you want to be influential about. Make sure it matters to your customers as much as to your brand. Find the right tools. Do some research on influencer marketing tools to help you better identify, qualify and recruit the right influencers. Romance prospective influencers by following them on social media, commenting on their posts and including them in your content. Make a relevant offer to collaborate or co-create content in a way that provides value to the influencer. Make it easy to contribute and even easier to share the resulting content that's created. There are a number of influencer identification methods available, ranging from the scientific (social network analysis and influence scoring algorithms) through to the less-so (desk research, anecdotal, intuitive). These different methods can demand varying levels of resource requirement, and some will yield more reliable results than others. Before jumping in, take a step back and define the type of social media influencer you want to engage with. In the broadest sense, an influencer can be defined as somebody who, through their expertise, thought leadership or track record of success within a sector or topic, has sway among a wide network of one or more audience groups. Influencers can be categorised into different groups, ranging from professional influencers to micro-influencers. We’re not necessarily talking about a partnership with Kim Kardashian here, although that may be what many think of when it comes to social media influencers. In fact, this focus on B2C celebrity influencers may be most of the reasoning behind the myth that influencer marketing is not suitable for B2B. However, there is certainly scope for B2B brands to use celebrities to engage and influence their audience. Take Knorr’s award-winning social media influencer marketing campaign with celebrity chef Phil Vickery. 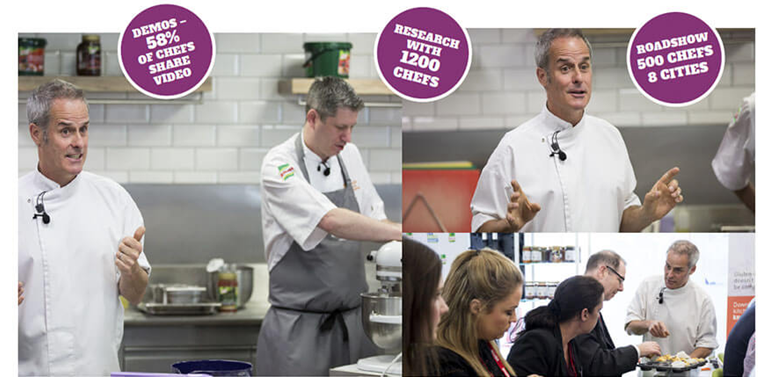 Targeting restaurant chefs, Knorr employed TV chef Phil Vickery to demo their gluten-free products to the trade across social using video, to great success. These are people who have successfully created their own personal brand and who may even make a living out of being influencers. They’re likely to be keynote speakers at industry events, and/or published authors, and often have a significant social media following (tens of thousands of followers). They can in some cases be considered ‘celebrities’ within their profession or industry: think Martin Sorrell, Duncan Ballantyne, Karen Brady. These people aren’t yet published authors or keynote speakers, but will have a significant level of influence. They’re likely to be journalists, bloggers or perhaps senior employees at big industry brands. You may even have influencers in your own organisation. 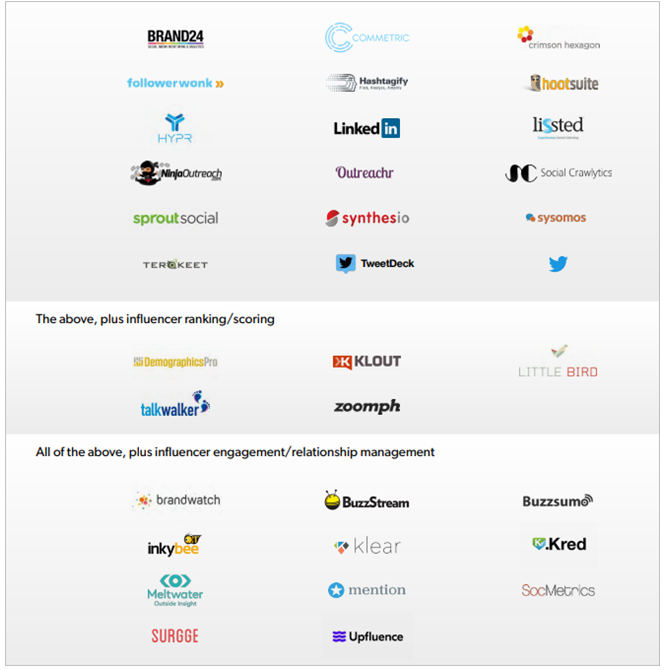 Here, Thomson Reuters created an influence campaign based on their own list of top 30 UK social influencers in risk management. These are experts on a particular topic area who haven’t necessarily focused their efforts on building a personal brand. They’re more likely to be academics, for instance. These people will have a smaller social following but are likely to have a more engaged audience (as explained here). Your customers could also be influencers – they will certainly have authority among your audience – but they won’t necessarily have focused on building their authority or social following publicly. However, it’s worth keeping an eye on particular customers whose voices resonate within your sector. Don’t underestimate the potential of your own employees. Those active and well connected through social media can form a highly effective employee advocacy programme. Once you’re aware of the different types of influencers and those you want to target to support your marketing outreach, you can start putting together your influencer list. How relevant are the influencer’s areas of expertise/interest to the topics that you want to be talking about with your audience? How big is the influencer’s reach, and how much of an overlap is there with your audience? How big is their social following and how well known are they across the industry? How much does the community care about what they say? Do they tend to lead and shape industry conversation? Answering these questions should help you evaluate whether an influencer is the right fit for your brand. It may well be, for example, that you’ve found an influencer who’s the perfect fit for your audience and a true subject matter expert, but their biggest presence is on YouTube, which isn’t a strong channel for your audience. Identifying what you want from your influencers is just as important as identifying who they are – don’t skip this step, as it could prove costly later on. Who are your top customer advocates? Who recommends you most often within the industry? Who do you wish recommended you within the industry? It’s likely you’re already doing some degree of social media listening/monitoring to inform your marketing and/or content strategy, in which case you should already have an idea of the sorts of discussions that take place around topics relevant to your audience, and any influencers who regularly get involved. There are numerous social listening tools out there, with the most straightforward free option being a simple Twitter hashtag search. Many social media monitoring tools such as BuzzSumo offer simple search tools for free (with more advanced tools part of their paid offering). The key thing to remember with social media platforms and tools is that not all social networks are equal when it comes to your particular brand or audience. While some influencers may have a strong presence on Twitter, LinkedIn might actually be a more important network for your particular audience. Or it might be that you’re more interested in influencers who are regular bloggers, in which case a tool like GroupHigh (a tool used to find influential bloggers) might be the best option for you. Though it may seem old-school in an increasingly digital world, events can also be a good way of identifying influencers, especially those who use public speaking to develop their own personal brand. Even if you don’t do this at the beginning of your influencer marketing programme, regularly attending industry conferences or other events can be a great way of finding new and upcoming names in your sector. Once you’ve created your initial influencer list, you’ll need to refine it in order to identify which influencers are truly the best match across the reach, relevance and resonance points mentioned above, as well as any other factors you might want to bear in mind. This step is important as you can’t expect to engage and work with your entire list of influencers at once. Select those who have the closest relationship to your brand already – who’s already talking about you and who has influence with your audience? While you may not have a direct relationship with these people yet, it’ll be much easier than engaging influencers who haven’t heard of you. It may seem tedious and time-consuming (and it probably is), but it’s likely that you’ll need to do a bit of work to check out the influencers on your list. The first reason for this is because some influencers may not be genuine (this is not something social monitoring tools can always detect), although a quick Google search will soon clear up whether or not somebody is who they say they are. The second reason for doing background research on your influencers is to explore channels where they could have a presence that might not have been picked up by your social tools (e.g. their own blogs), as well as any existing connections they might have with competitor brands.